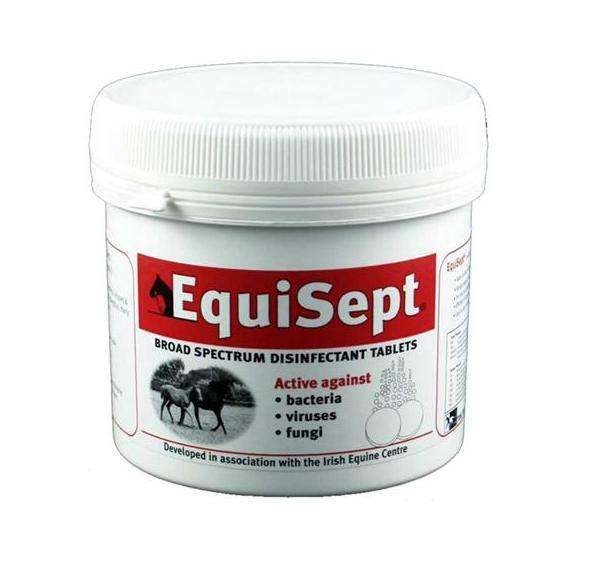 TRM Equisept is a broad spectrum equine disinfectant which comes in tablet form which is easily disolved in water to create an effective cleaning solution which is active against bacteria, fungi and viruses. All surfaces (floors, walls, doors, etc. ), Feeding/Drinking Equipment, Stables, Transport, Footwear Baths, Rubber Boots, Brushes, Water Tanks and Drinking Lines, Bulk Silos. Clean first! It is not possible to disinfect dirt, so before disinfection remove all dirt and debris; scrape and brush all surfaces (vacuum if necessary); then power wash or use a power nozzle from the mains water supply. Equisept is presented as a 10g effervescent tablet (containing 5g Troclosene Sodium (NaDCC) - (the active ingredient). There are currently no questions for TRM Equisept Equine Disinfectant - be the first to ask one!